When Leigh Goodwyn ’88 graduated from Carolina, becoming a business owner wasn’t necessarily part of the plan. The innovative entrepreneur began her career as a producer with CNN after earning her degree in journalism. She transitioned from what she described as a “noble calling” to the sales and marketing side for Turner Broadcasting. She then served as the head of international marketing at Discovery Channel and went on to be vice president of marketing and communications for Discovery Place, the regional science center based in Charlotte, North Carolina. 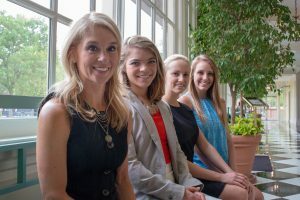 Leigh Goodwyn, left, and her dorm-furnishings company, LeighDeux, provide scholarships and mentoring for young women, such as Mary McCall Leland, Kelly Allen and Kyra Harbert, left to right, who aspire to be entrepreneurs. But it was a life-change for her daughter that brought about her career shift as an entrepreneur. When daughter Carson ’20, was heading to boarding school, there weren’t a lot of options for quality, fashionable bedding for dorm rooms, and the idea for her company LeighDeux was born. As a business owner and president of the upscale dorm furnishings company, Goodwyn wears many hats—from running day-to-day operations, to product design, to marketing and public relations, to directing photoshoots, to social media. But that is the nature of an entrepreneur. She credits her journalism background for preparing her to handle the many facets of running her own company. “The media business is an ever-changing, fast-paced environment, and because I was in that industry for 20 years, it prepared me for a lot of things,” Goodwyn said. Her career change wasn’t entirely unexpected, however. When they founded the company, Goodwyn knew there would be a social mission involved. Very active in philanthropy in Charlotte, she wanted to continue that work through LeighDeux. As the company produces bedding and décor for college dorm rooms, a scholarship fund was the perfect fit. The company provides support for students in the Shuford Program in Entrepreneurship who are interested in starting their own ventures. The funding is already making a difference for the four recipients who have received the scholarship since its establishment. Mary McCall Leland ’20, a business and public policy double major and entrepreneurship minor from Tarboro, North Carolina, co-founded Connect252, a website that seeks to connect the eastern region of the state by highlighting the many cultural events each town and area has to offer. As someone who has gone before, Goodwyn is able to serve as a valuable resource in offering advice and guidance. As Goodwyn continues to pave the way in business and in service to UNC, one thing is certain: she sets an example that many will want to follow.